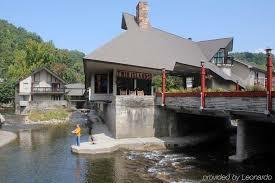 Smoky Mountains Lodging Guide: BEST WESTERN TWIN ISLANDS - DOWNTOWN BUT MILES AWAY! BEST WESTERN TWIN ISLANDS - DOWNTOWN BUT MILES AWAY! In Gatlinburg, Tennessee, a unique hotel sits in the middle of town but is separated by a mountain stream and retail shops and restaurants from the hustle and bustle of the town itself. This hotel is the Best Western Twin Islands, and it is unique for many other reasons. The firsts part of the hotel was built in the 1950's and adding on continued through 1985. Each section of the hotel interior reflects the style of the time from red brick walls to tongue-in-grove siding, and many guests specifically request the sections of the hotel that make them feel most at home. The siding hasn't changed but the furniture, carpet and linens are updated continually to provide the guests a great customer experience. The courtyard of the Best Western Twin Islands is beautifully landscaped with flowers and trees, and offers picnic areas, charcoal grills, ducks and the occasional geese dropping by to visit. There is also an outdoor pool, Pirate Ship playground, swings, slides, a Kiddie Pool and hot tub. All of the elements to provide a relaxing, family friendly environment. At least three generations of families have made the Best Western Twin Islands their home away from home when they visit Gatlinburg. They love the family friendly atmosphere and have gotten to know the staff, many of which have been with the hotel for decades. And, if they can't get "their room", they change their dates and come when it is available. If it sounds like a great place to stay, it is. 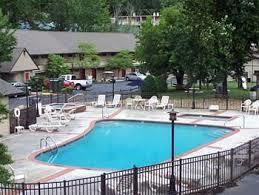 If you want a place that is convenient to downtown Gatlinburg, but where you can relax, hear children laughing and playing, then Best Western Twin Islands is your kind of place. Don't wait too long to book because three generations of visitors are already planning to book "their room"! For more lodging, attraction, shopping, dining and live show information, visit the Best Read Guide website at http://www.bestreadguidesmokymountains.com/ and don't forget to print out the coupons!